The vast majority of tablet POS systems are designed for Apple’s iOS operating system and iPad hardware. Apple creates outstanding consumer products that are both sleek and easy to use - it’s true. I have a Mac laptop, I always purchase the newest iPhone model when I’m eligible for an upgrade, and if I were going to purchase a tablet for personal use I wouldn’t consider buying anything other than an iPad. That said, while these products are designed for and relied on by consumers, like me, they are not necessarily the best fit for commercial use in the fast-paced, and often chaotic, restaurant industry. While we could debate the strengths and weaknesses of the Android and iOS operating systems, at the end of the day, the quality of any POS software is going to be determined by the team that builds it, not whether it’s built on Android or iOS. For that reason, let's forget about the two operating systems and POS software altogether; let’s focus on the hardware: Apple vs. Android. Although Apple hardware is often very appealing from the consumer's standpoint, when it comes to choosing which one to rely on for your restaurant you are not making a purchase as a consumer. When you purchase a restaurant POS system, you are purchasing a mission critical system for your restaurant. In order to have a successful experience with the system, the hardware needs to be designed for commercial use and be able to handle the daily wear and tear it will undergo in the restaurant environment. Full Disclosure: Toast is built on the Android operating system compatible with Android terminal and tablet hardware. Restaurants rely on their POS system to support every aspect of their operations. When the system goes down or does not work properly, it can be devastating to the restaurant’s ability to serve guests and make money. Restaurants need POS hardware that is not only sleek and easy to use, but that is also durable enough to handle any volume of industrial use, and the occasional drop or spill. Unlike iPad hardware, which is exclusively manufactured by Apple, Android tablets are provided by many different vendors. 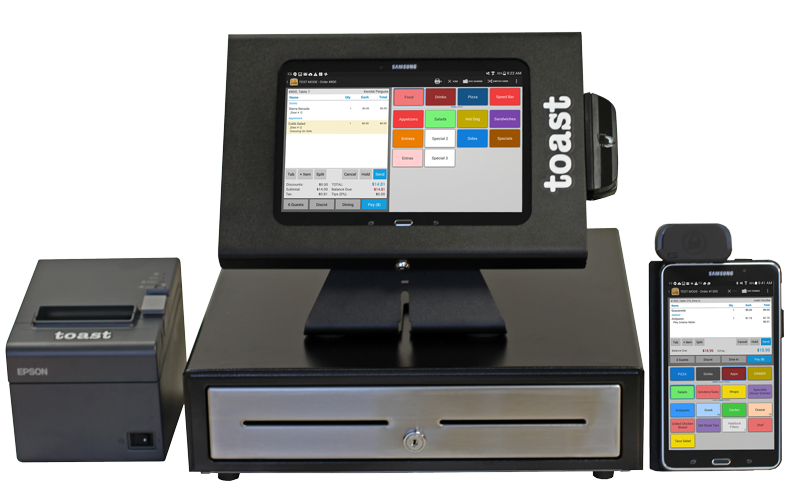 This gives Android POS companies (like Toast), the unique opportunity to test many different hardware options until they find the option that is the best fit for supporting their software and for the chaotic restaurant environment. Toast chooses to supply Android hardware not because we have to, but because we’ve found it to be the highest quality and most effective option for our customers. No two restaurants are the same. There are many different service types and each restaurant has its own unique internal operations, priorities, and needs. Android hardware is available in many different screen size form factors, which allows restaurants to select the combination of hardware that best matches their operational needs. For instance, a quick service restaurant might prioritize larger terminal hardware while a full service restaurant may purchase only one or two terminal systems and equip the wait staff with mobile handheld tablets. POS software that is created using the iOS operating system can only be used in conjunction with iPad, iPhone, or iPod hardware, which limits the restaurant's ability to customize their POS setup to their specific needs. When it comes to restaurant POS systems, you don’t always get what you pay for - paying more does not ensure that you’ll get a better system. Legacy POS systems that charge upwards of $10,000 in upfront fees for an on-premise, outdated computer have made that explicitly clear. In addition to offering more form factor options and greater durability, Android tablets are also significantly cheaper than iPad hardware. In the fast-paced foodservice industry, mistakes happen. Android tablets are more cost-effective than iPad hardware, so if a product is lost, stolen, or mistreated, restaurants can replace the tablet without having to worry too much about how it will impact their ability to meet their bottom line. There is also less risk of theft with Android POS hardware because it is less expensive and less attractive to consumers than iPad hardware.